"The Pythagoreans considered all mathematical science to be divided into four parts: one half they marked off as concerned with quantity, the other half with magnitude; and each of these they posited as twofold. A quantity can be considered in regard to its character by itself or in its relation to another quantity; magnitudes as either stationary or in motion. Arithmetic, then, studies quantity as such; music the relations between quantities; geometry [studies] magnitude at rest, spherics [studies] magnitude inherently moving." The Via Mathesis is the path of spiritual attainment through the inner qualitative experience of quantitative mathematical truth. The basic skills of the mathematical alchemist are weighing and counting, reminding us of the a Masonic doctrine that "the Master Builder hath ordered all things by weight, measure, and number." The story of Genesis chapter I can be read as a geometric meditation in the following way. First get out your compass and prepare to draw some circles. We follow Aryeh Kaplan's lead on reading sacred texts in the imperative so as to treat them as meditative verses, which he used to give an interesting translation of Sepher Yetzirah. All verbs are given in present tense, since we want to understand the creation story as if it were taking place in front of us with our geometric tools. The word simply translated "God" is actually "Elohim" in the original Hebrew text of Genesis. But the word "Elohim" has the "-im" suffix, making it plural. Esoteric traditions understand the "Elohim" to be a rank of spiritual beings who inhabit the Sun and hold the knowledge of the geometric laws of creation underlying the forms of the physical world. When reading the following rendering of Genesis I, please remember that this is to be understood. To make this into a meditation, take your compass and a blank sheet of paper, and draw a circle to represent the Divine Monad as the center of the process. 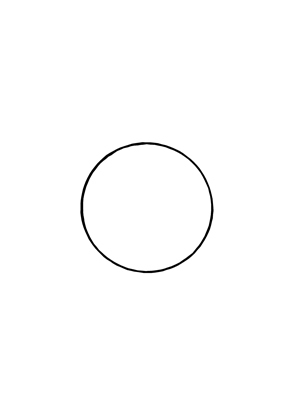 Then for each of the 6 Days of active creation you will draw another circle as shown below. Recite the text as you work through the construction process. Before the Beginning (Resheit), the ineffable One existed without a second. In the beginning the Elohim created the heaven and the earth. And the earth was without form, and void; and darkness was upon the face of the abyss. And the Spirits of the Elohim are vibrating upon the face of the waters. And the Elohim are saying, Let there be light: and now there is light. And the Elohim are seeing the light, that it is good: and the Elohim are dividing the light from the darkness. And the Elohim are calling the light Day, and the darkness they are calling Night. And the evening and the morning are Day One. And the Elohim are saying, Let there be a firmament in the midst of the waters, and let it divide the waters from the waters. And the Elohim are making the firmament, and dividing the waters which are under the firmament from the waters which are above the firmament: and it is so. And the Elohim are calling the firmament Heaven. And the evening and the morning are Day Two. And the Elohim are saying, Let the waters under the heaven be gathered together unto one place, and let the dry land appear: and it is so. And the Elohim are calling the dry land Earth; and the gathering together of the waters they are calling Seas: and the Elohim are seeing that is good. And the Elohim are saying, Let the earth bring forth grass, the herb yielding seed, and the fruit tree yielding fruit after his kind, whose seed is in itself, upon the earth: and it is so. And the earth is bringing forth grass, and herb yielding seed after its kind, and the tree yielding fruit, whose seed is in itself, after its kind: and the Elohim are seeing that it is good. And the evening and the morning are Day Three. And let them be for lights in the firmament of the heaven to give light upon the earth: and it is so. And the Elohim are making two great lights; the greater light to rule the day, and the lesser light to rule the night: they are making the stars also. And to rule over the day and over the night, and to divide the light from the darkness: and the Elohim are seeing that it is good. And the evening and the morning are Day Four. And the Elohim are saying, Let the waters bring forth abundantly the moving creature that hath life, and fowl may fly above the earth in the open firmament of heaven. And the Elohim are creating great whales, and every living creature that moves, which the waters brought forth abundantly, after their kind, and every winged fowl after his kind: and the Elohim are seeing that it is good. And the Elohim are blessing them, saying, Be fruitful, and multiply, and fill the waters in the seas, and let fowl multiply in the earth. And the evening and the morning are Day Five. And the Elohim are saying, Let the earth bring forth the living creature after their kind, cattle, and creeping thing, and beast of the earth after their kind: and it is so. And the Elohim are making the beast of the earth after their kind, and cattle after their kind, and everything that creeps upon the earth after their kind: and the Elohim are seeing that it is good. And the Elohim are saying, We are making humanity in our imagination, as likeness of us: and letting them have dominion over the fish of the sea, and over the fowl of the air, and over the cattle, and over all the earth, and over every creeping thing that creeps upon the earth. So the Elohim are creating humanity in their imagination, in the imagination of the Elohim they are creating humanity; male and female they are creating them. And the Elohim are blessing them, and the Elohim are saying unto them, Be fruitful, and multiply, and replenish the earth, and subdue it: and have dominion over the fish of the sea, and over the fowl of the air, and over every living thing that moves upon the earth. And the Elohim are saying, Behold, I am giving you every herb bearing seed, which is upon the face of all the earth, and every tree, in which is the fruit of a tree yielding seed; to you it shall be for food. And to every beast of the earth, and to every fowl of the air, and to everything that creeps upon the earth, wherein there is life, we have given every green herb for food: and it is so. And the Elohim are seeing everything that they are making, and, behold, it is very good. And the evening and the morning are Day Six. Thus the heavens and the earth are becoming finished, and all the host of them. And on Day Seven, the Elohim are finishing their work which they are making; and they are resting on Day Seven from all their work which they are making. There is no circle drawn on the Seventh Day, as this is the Shabbat, the Day of Rest. 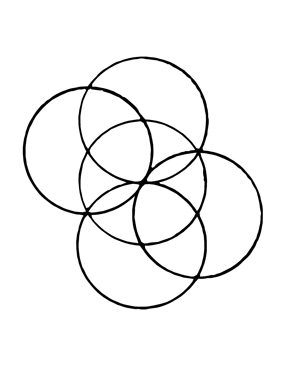 Notice how the emanation of the six circles around the central circle proceeds in diametric pairings. This is similar to the description of the creation of the Cube of Space as described in the Sepher Yetzirah. It tells of an extension of a central point into the six directions of space, and their order is Above, Below, East, West, North, South. 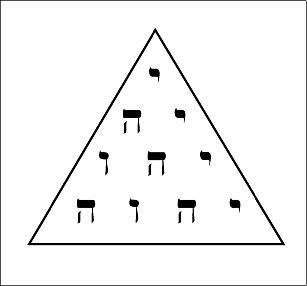 These are the first six Doubles in the Hebrew alphabet. Finally there is Tav, described as the "Palace of Holiness in the middle". Tav is attribued to the planet Saturn, which is a fitting place for the Seventh Day. Pythagorean Number Philosophy is based on the pattern of the first ten Numbers. These Numbers are the core pattern of philosophical laws for contemplating the mysteries of The ONE. 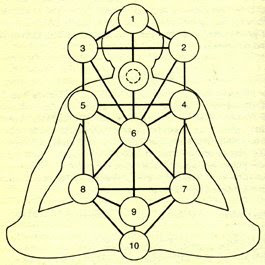 Understanding the Number pattern from the Monad to the Decad is the first stage in an alchemical process to harmonize personal consciousness with the flow of universal consciousness. Through a crystallization process this pattern is hard-wired into our subconscious Net of associations, and becomes a platform for stepping into mystical states where pure knowing is achieved (gnosis via mathesis). 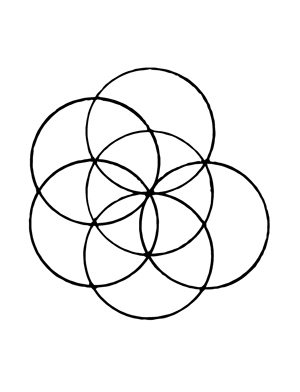 The Pythagoreans gathered around the holy Tetractys as the principal symbol of their philosophy of Numbers. It displays the progression of the Monad to the Decad as a dot-pattern in the form of a triangle, called a figurate. 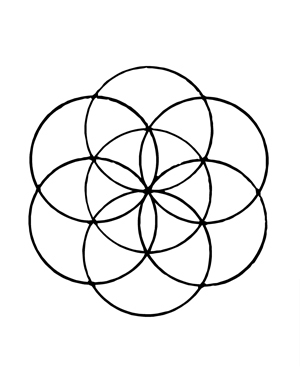 The Tetractys encodes many secrets of the universe, and is to be taken as a cosmological symbol. There are 4 levels, symbolizing 4 philosophical or metaphysical worlds. The numerical progression of levels (1:2:3:4) gives the fundamental harmonic proportions used for constructing the Pythagorean Diatonic scale. 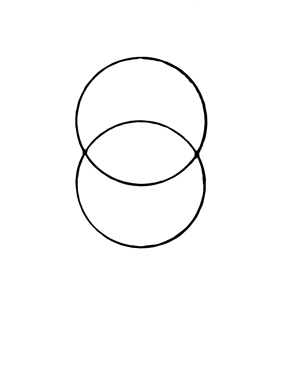 In total we have 10 dots, which are viewed as the 10 aspects or qualities of being within The ONE. This was taken to be the complete map of all that is, since all other numbers could be reduced to one of these. The use of base-10 counting was seen as a reflection of this philosophical truth within human understanding. 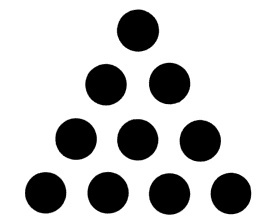 As a figurate, the Tetractys is the 4th Triangular Number. The Triangular Numbers are given as the sums of consecutive numbers, beginning with 1. So 1+2=3, 1+2+3=6, and 1+2+3+4=10, making 10 the 4th Triangular. Taken philosophically, since 10 reduces to 1 (1+0=1) we have that 4 is really 1. So there is a pattern from 1 to 2 to 3 to 4, but 4 is really 1. Since we return to 1, we must continue to 2 and 3, but then 2+3=5, 1+2+3=6, 4+3=7, 1+3+4=8, 2+3+4=9, and 1+2+3+4=10. So by staying within 1 to 4, we can generate all 10. When seen from modern mathematics, these calculations would seem infantile, but when viewed philosophically, we can see why the Tetractys could merit such veneration. We may not be surprised, then, to recall that the Divine Names in most ancient mysteries were spelled with 4 letters. In Greek ThEOS and in Hebrew YHVH. The latter is known as the Tetragrammaton, or 4-letter Name, which encodes a profound universal pattern of Numbers, which I shall explain in future posts. The Pythagorean doctrine of the Decad may be responsible for the Qabalistic doctrine of Ten Sephiroth. The Qabalists also based their metaphysical system on a system of Ten, and while the earliest of Qabalistic texts refering to these Ten Sephiroth, the Sepher Yetzirah, is generally dated by scholars to be at least several hundered years after the time of Pythagoras, but the correspondence between the two is nearly the same. They can be studied in conjunction, yielding the fruits of cross-fertilization. The First Stage of Self-Initiation into Pythagorean Number Philosophy is to develop in one's consciousness the ideas and images that follow from contemplating the following series of seed-ideas. Once the mathematician-alchemist has distilled and digested this Number pattern, repeated study leads to crystallization and a kind of prototype for the Stone of the philosophers. The Philosophy begins by establishing the Greek names for the numbers, to remind us that they are to be thought of as philosophical qualities. Then we try to understand the Numbers as states in a dynamical movement, as indicated by the meanings of the key-words. These key-words have been chosen very carefully by the philosophers so that they may help you unlock the secrets which lie hidden within our philosophy. In future posts, we will explore the link of Number to Geometry. The geometry associated with the Numbers gives us a way to visualize the pattern in ways that lead to better understanding, but also gives us a Path to follow and a way to Truth. We will also see how Letters can stand in for Geometry, leading to a sacred script for describing and preserving the mystical experiences of the mathematician-philosophers. The philosophical tradition surrounding the name of Pythagoras derives its mistique from how little we know of its origins, while at the same time can claim the mathematical development and scientific advancements as verification of its basis in wisdom and truth. 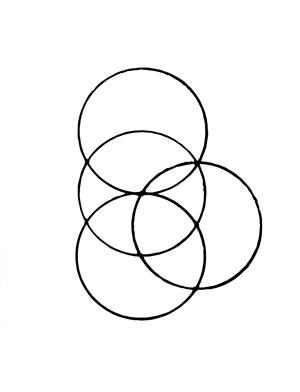 "Things, then, both those properly so called and those that simply have the name, are some of them unified and continuous, for example, an animal, the universe, a tree, and the like, which are properly and peculiarly called "magnitudes"; others are discontinuous, in a side-by-side arrangement, and, as it were, in heaps, which are called "multitudes", a flock, for instance, a people, a heap, a chorus, and the like. "Wisdom, then, must be considered to be knowledge of these two forms. Since, however, all multitude and magnitude are by their own nature of necessity infinite-- for multitude starts from a definite root and never ceases increasing; and magnitude, when division beginning with a limited whole is carried on, cannot bring the dividing process to an end, but proceeds therefore to infinity-- and since sciences are always sciences of limited things, and never of infinites, it is accordingly evident that a science dealing either with magnitude, per se, or with multitude, per se, could never be formulated, for each of them is limitless in itself, multitude in the direction of the more, and magnitude in the direction of the less. A science, however, would arise to deal with something separated from each of them, with quantity, set of from multitude, and size, set off from magnitude. Again, to start afresh, since of quantity one kind is viewed by itself, having no relation to anything else, as "even", "odd", "perfect", and the like, and the other is relative to something else and is conceived of together with its relationship to another thing, like "double", "greater", "smaller", [etc], it is clear that two scientific methods will lay hold of and deal with the whole investigation of quantity; arithmetic, absolute quantity, and music, relative quantity. "And once more, inasmuch as part of "size" is in a state of rest and stability, and another part in motion and revolution, two other sciences in the same way will accurately treat of "size", geometry the part that abides and is at rest, astronomy that which moves and revolves." "The Pythagoreans considered all mathematical science to be divided into four parts: one half they marked off as concerned with quantity, the other half with magnitude; and each of these they posited as twofold. A quantity can be considered in regard to its character by itself or in its relation to another quantity; magnitudes as either stationary or in motion. Arithmetic, then, studies quantity as such; music the relations between quantities; geometry [studies] magnitude at rest, spherics [studies] magnitude inherently moving. The Pythagoreans consider quantity and magnitude not in their generality, however, but only as finite in each case. For they say that the sciences study the finite in abstraction from infinite quantities and magnitudes, since it is impossible to comprehend infinity in either of them. Since this assertion is made by men who have reached the summit of wisdom, it is not for us to demand that we be taught about quantity in sense objects or magnitude that appears in bodies. To examine these matters is, I think, the province of the science of nature, not that of mathematics itself." "Which then of these four methods must we first learn? Evidently, the one which naturally exists before them all, is superior and takes the place of origin and root and, as it were, of mother to the others. And this is arithmetic, not solely because we said that it existed before all the others in the mind of the creating God like some universal and exemplary plan, relying upon which as a design and archetypal example the creator of the universe sets in order to their proper ends; but also because it is naturally prior in birth, inasmuch as it abolishes other sciences with itself, but is not abolished together with them. "So it is with the foregoing sciences; if geometry exists, arithmetic must also needs be implied, for it is with the help of this latter that we can speak of triangle, quadrilateral, octahedron, icosahedron, double, eightfold, or one and one-half times, or anything else of the sort which is used as a term by geometry, and such things cannot be conceived of without the numbers that are implied with each one. 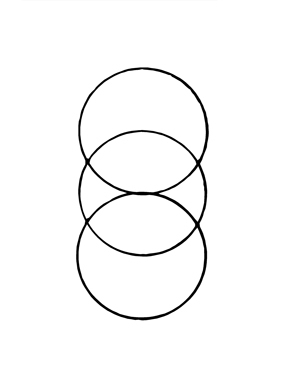 For how can "triple" exist, or be spoken of, unless, the number 3 exists beforehand, or "eightfold", without 8? But on the contrary 3, 4, and the rest might be without the figures existing to which they give names. "Hence arithmetic abolishes geometry along with itself, but is not abolished by it, and while it is implied by geometry, it does not itself imply geometry. "And once more is this true in the case of music; not only because the absolute is prior to the relative, as "great" to "greater" and "rich" to "richer" and "man" to "father", but also because the musical harmonies, diatessaron, diapente, and diapason, are named for numbers; similiarly all of their harmonic ratios are arithmetical ones, for the diatessaron is the ratio 4:3, the diapente that of 3:2, and the diapason the double ratio; and the most perfect, the didiapason, is the quadruple ratio. "More evidently still astronomy attains through arithmetic the investigations that pertain to it, not alone because it is later than geometry in origin-- for motion naturally comes after rest-- nor because the motions of the stars have a perfectly melodious harmony, but also because risings, settings, progressions, retrogressions, increases, and all sorts of phases are governed by numerical cycles and quantites. "So then we have rightly undertaken first the systematic treatment of this, as the science naturally prior, more honorable, and more venerable, and as it were, mother and nurse of the rest." It is recommended that a deeper understanding of the philosophy of the Quadrivium is gained by meditation on these quotations from the mathematician-philosophers. We shall be exploring the Quadrivium and related areas in future posts.